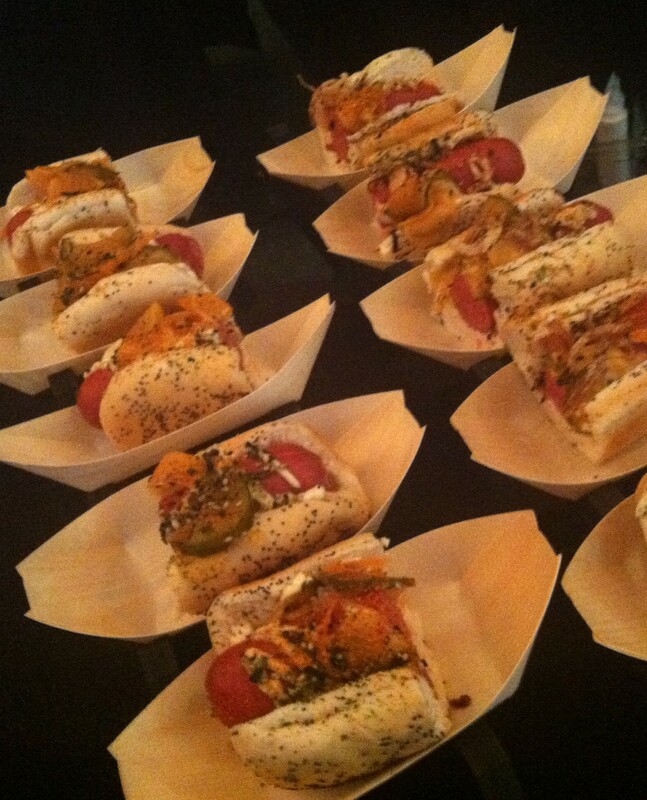 100 Chicago Chefs! Share Our Strength Taste of Nations | What's the Mary Delia? Skinny chefs. Fat chefs. Tattooed chefs. Bandana-ed chefs. Young serious chefs. Young fun looking chefs. Established boss looking chefs. 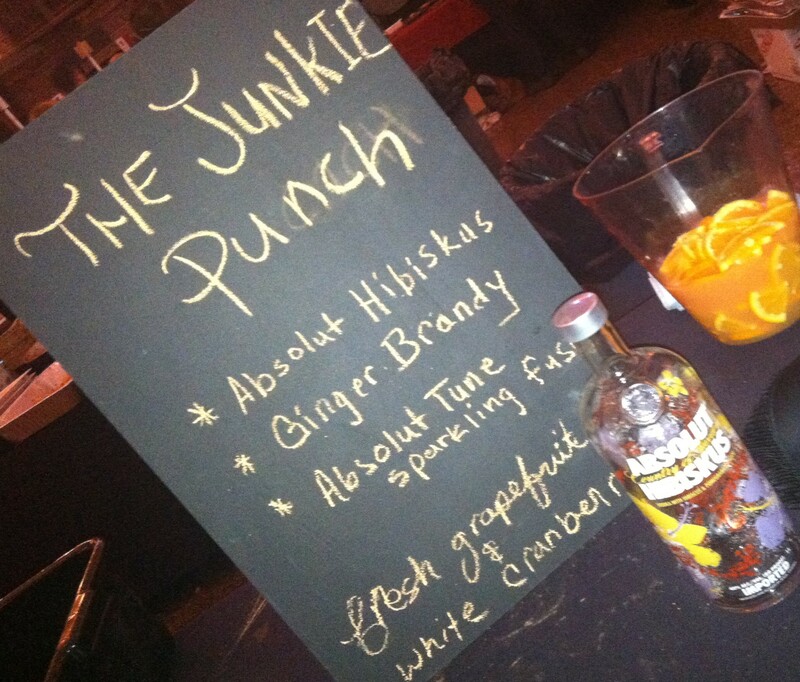 There were legions of mixologists in black chef coats crafting all kinds of boutique cocktails! There were smooth talking suited Front of House guys and there was an army of Back of House waiter types from Navy Pier keeping all plates and glasses cleared. 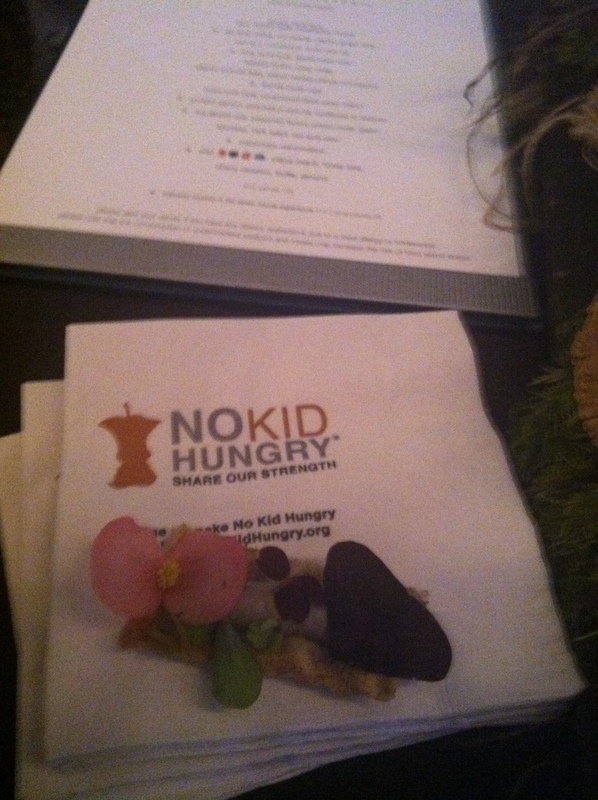 Taste of Nations brings together the best chefs and foodies in the city to raise money for the No Kid Hungry Campaign of the organization Share our Strength. 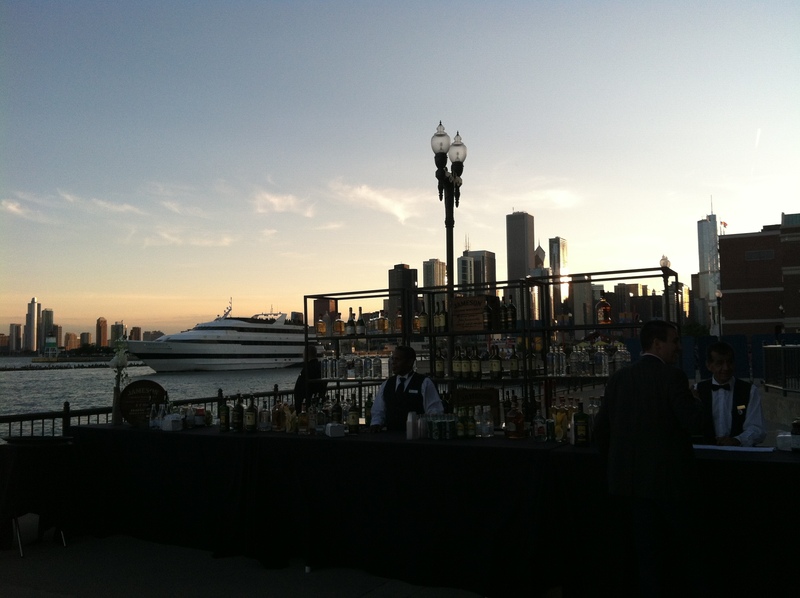 It was a spectacular night at Navy Pier. The $125 ticket was worth it with by first smell that greeted me on the walk to the Grand Ballroom at the end of Navy Pier. 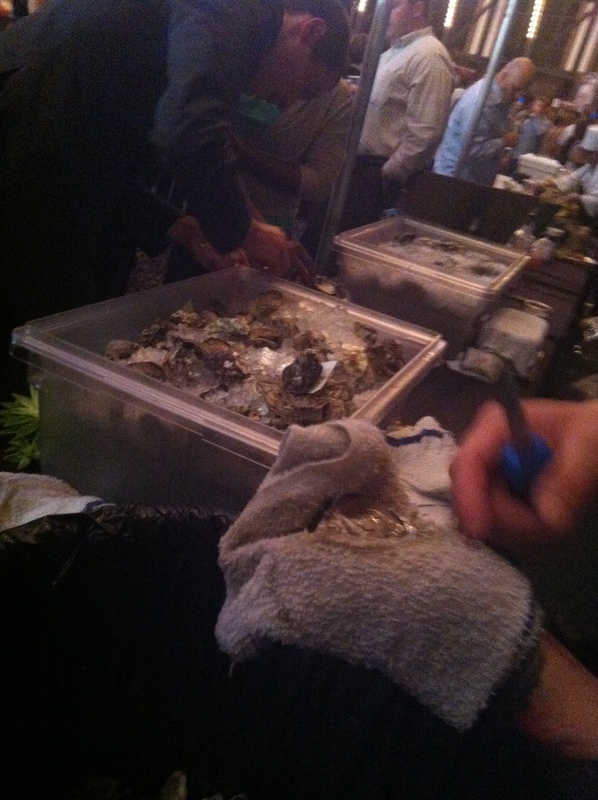 If you had me at the smell you won me with the first station of ….Oysters! 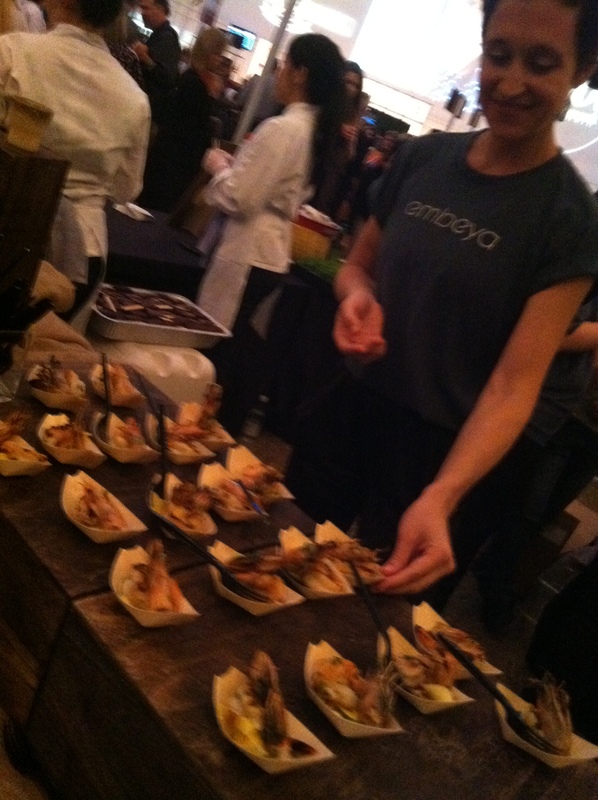 Note shucking chef and Front of House suited guy in the photo below. The event was very swanky with lots of Beautiful People. I was determined not to be distracted by all that. 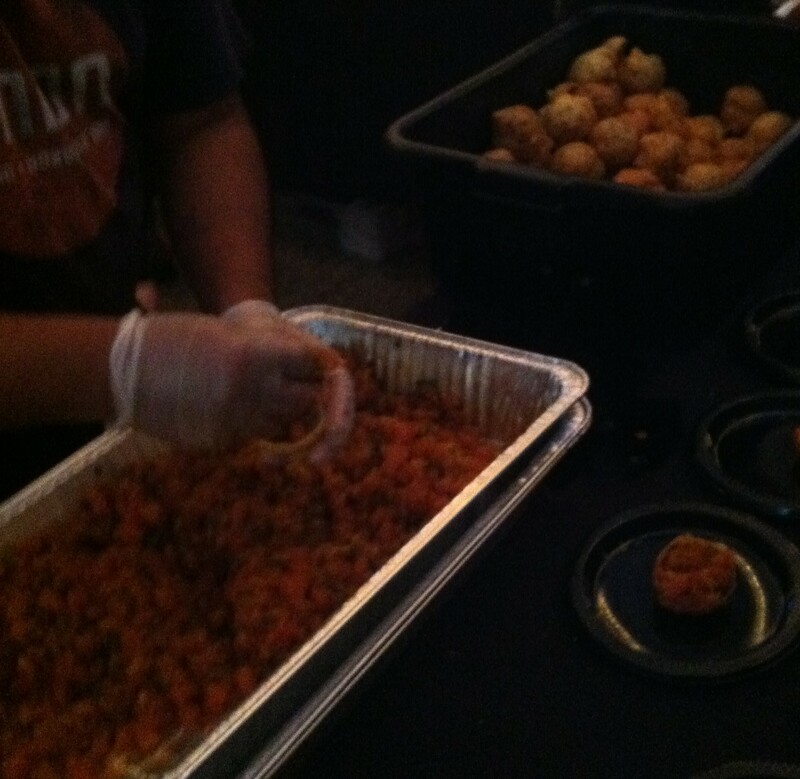 There were countless small plates of deliciousness to be consumed for my beloved blog. I put a fork, a Perrier and a pile of cocktail napkins in my purse and hit it. 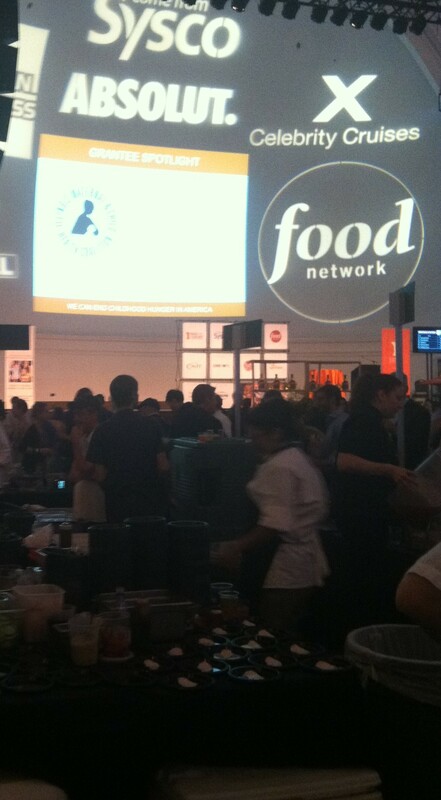 Being a savvy (and focused) foodie I crossed the ballroom to the further and less crowded side of the room. I was impressed with the massive and well sponsored set up of the event – excellent! That’s lobster salad from Benny’s Steak House (it’s newer at Wacker and Grand) The chefs were cute and the salad was made with a new favorite word pairing of mine; beef mayo. Nice first bite. I headed outside for the Lake Michigan views and the fire of BBQ. 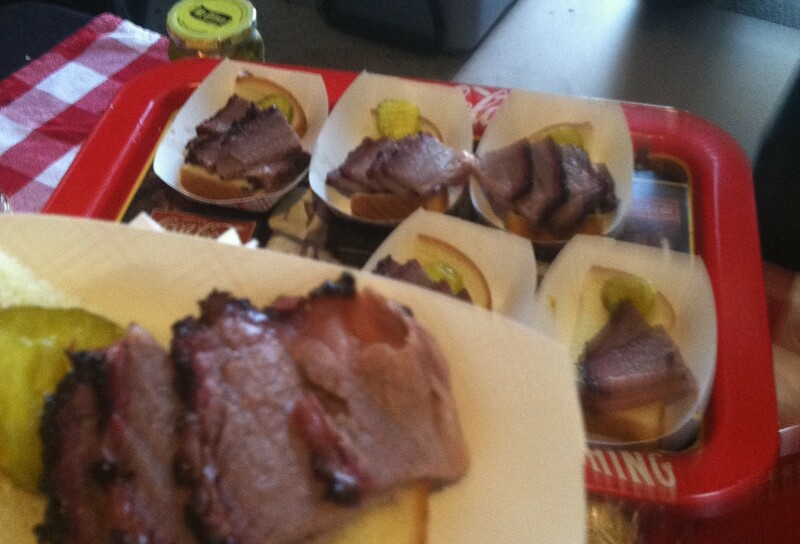 Old school bread and pickle and the bark on this generous portion of meat made me cry just a little bit. www.bubcitychicago.com Remember Lady Gaga’s raw meat dress? Well, the VIP Chef After Party was at Bub City and I was very seriously considering doing something similar outside their smoker later in the evening but with cooked meat and sauce as coverage. Of course I am a lady so I didn’t but with meat this good I gave it serious thought. It’s a Bacon Taco. 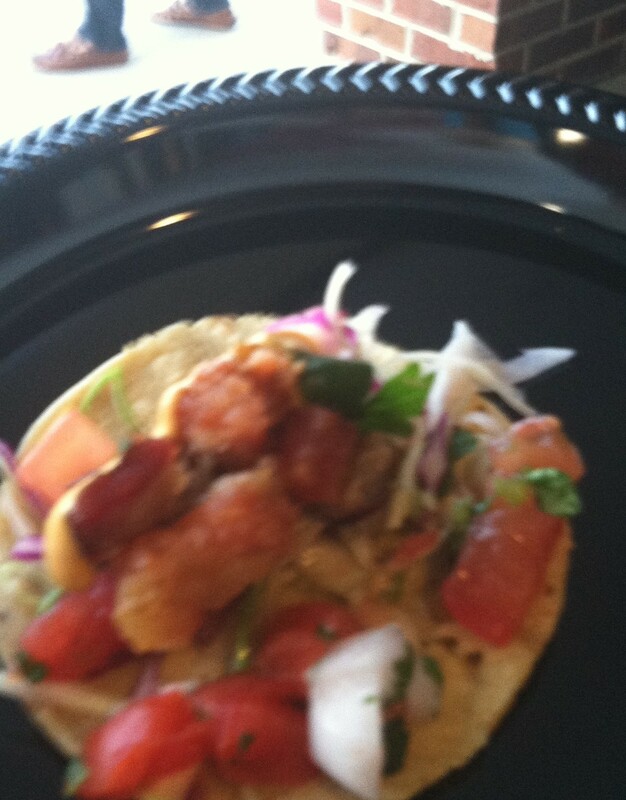 There’s a Western Michigan minor league baseball team that serves a taco with a shell made of bacon (it’s on CNBC) and I was thinking of driving there to try it but then I had this bite of bacon taco-y goodness. Have a great season, White Caps, I am all set on Bacon Tacos. 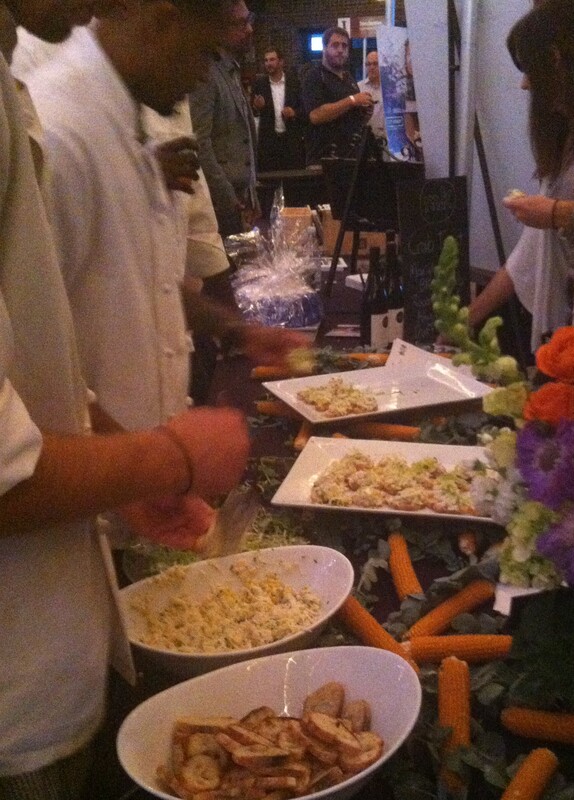 Three hunky chef types from MK assembling blue crab with truffled oil toast point bites. 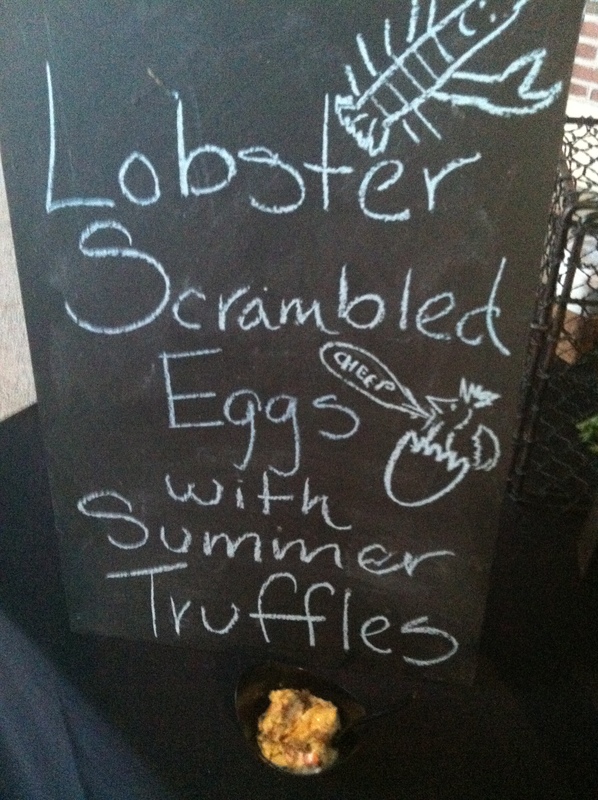 Delish, swanky ingredients and chef-y eye candy. 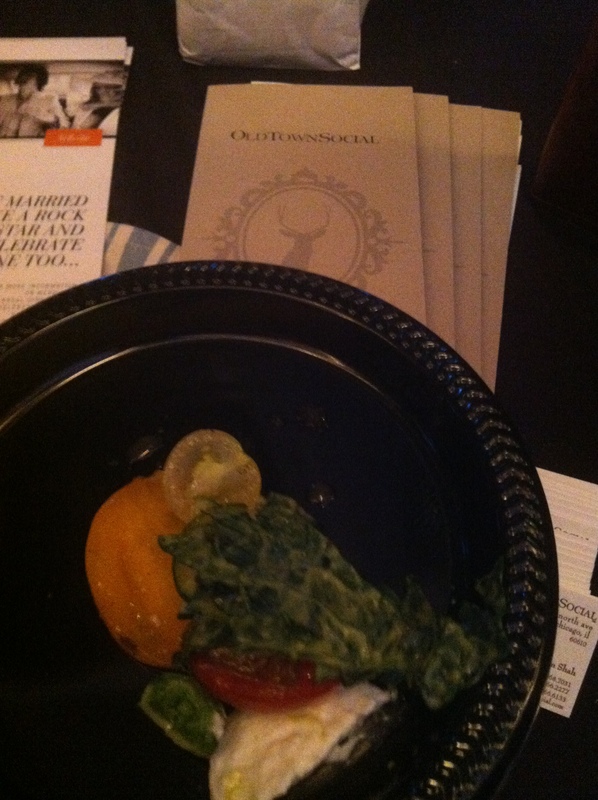 Old Town Social brings a vegetable! Can we all just agree kale is oddly trendy right now? Can we also agree it needs bacon to be delish? We can not agree because this was summer perfect heirloom tomatoes with whipped Burrata cheese covered in … terrifically delicious …kale salad. I stand corrected. See you at Whole Foods, Kale. Giant tub of perfectly spicy excellent Ahi tuna – check. Endless crispy delicious sesame cups – check. How much pressure must it be to work at the Signature Room at 95th Floor? Everyone is there for a special occasion! I wonder what the policy is if the lady turns down the proposal – does he just stay on his knee talking her into it? Or have they developed an elegant out of some kind? I say serve up this grilled octopus with smoky vegetable salad. 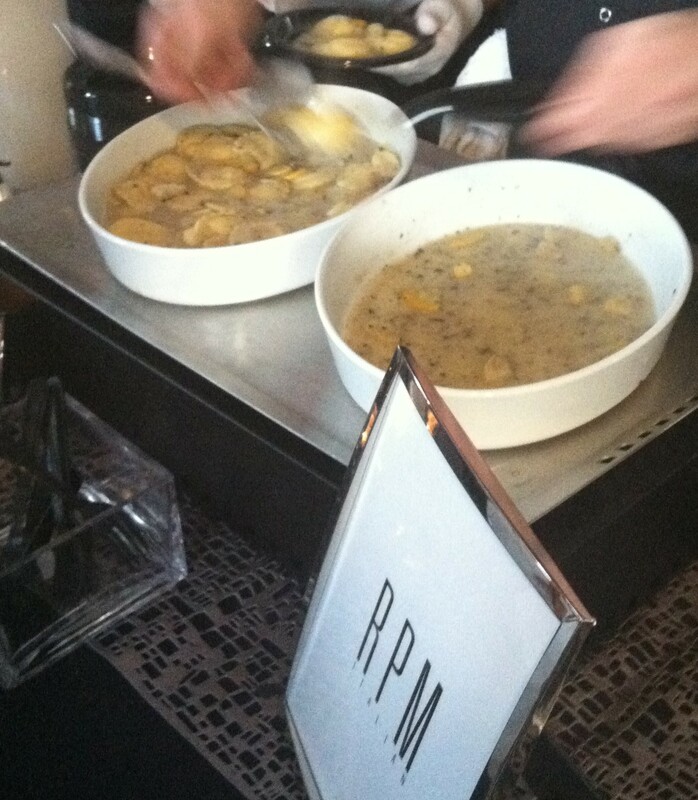 Truffle perfect ravioli! If Bill and Guiliana need a nanny for Duke they can pay me in RPM dollars. 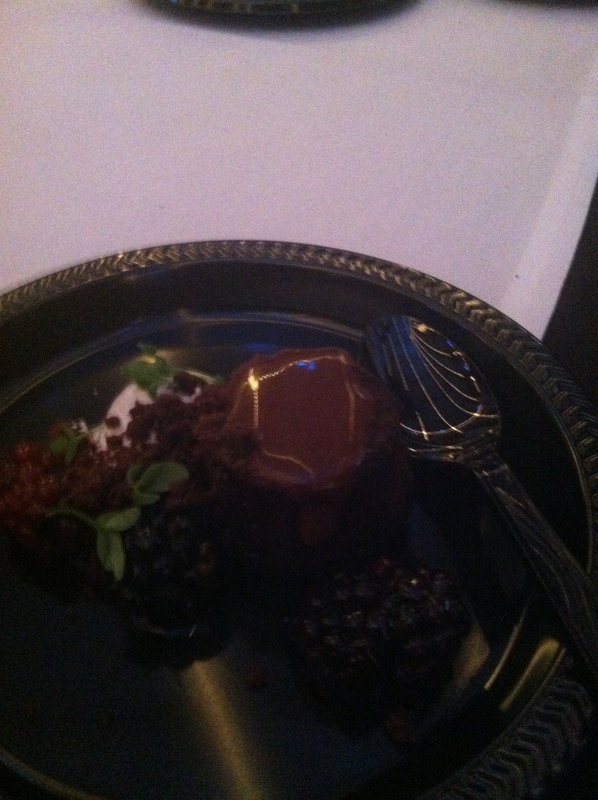 This very pretty chef from somewhere in the Rick Bayless empire had a silver bowl full of beautiful blackberries and a pot of melted chocolate and she put them on this plate with this perfect little bit of chocolate cake. After the first bite all other details have been lost. Thank you! Thank you! 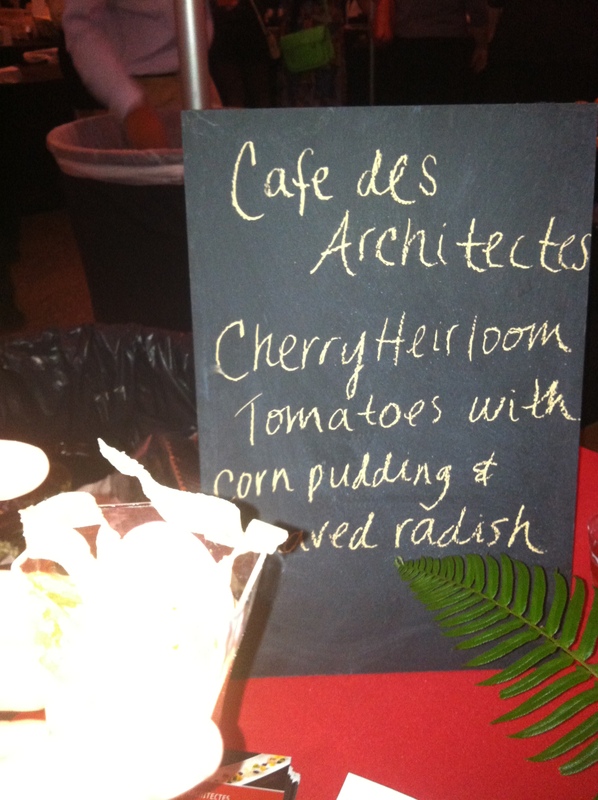 There were lots of seasonal ingredients; heirloom tomatoes, corn, zucchini but the winner in seasonal ingredients was this corn pudding from Café Architects. So smooth and smooth and smooth. The phrase mouth feel was invented for little cups of goodness like this. 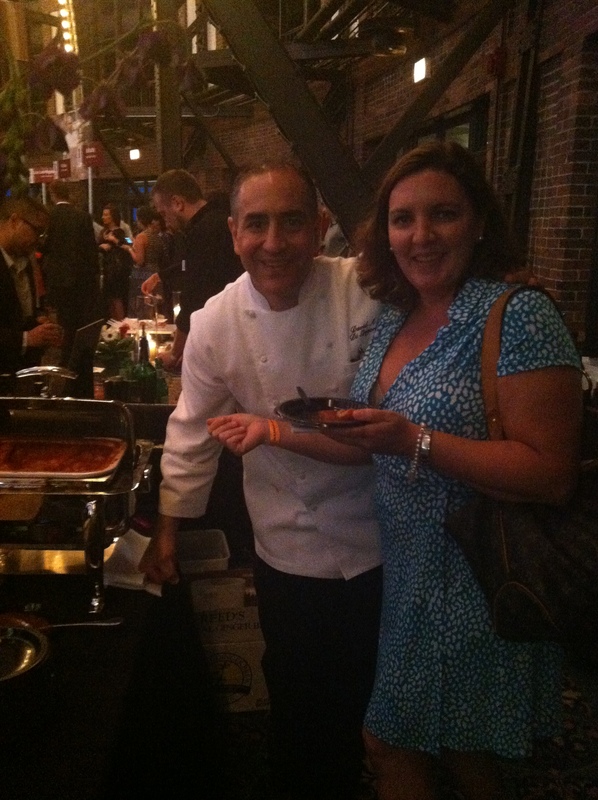 And chef liked my suggestion of creating a spoon made of bacon! www.cafesdesarchitectes.com The Sofitel chef has a non-French sense of humor! Merci! Isn’t this display beautiful? It’s from Tru. This lovely bit of constructed nature had two very welcoming, snazzy dudes on either side of it . As a woman on an eating mission I had to ask …is there any food here… ? Why, yes, in Tru style there were little bits of a ‘cracker’ made of mushroom with an edible flower type item nestled in some kind of spread of deliciousness. It was so tasty and clever I missed some of the description… but I did find out the Tru no longer serves the three types of caviar in crystal staircases. 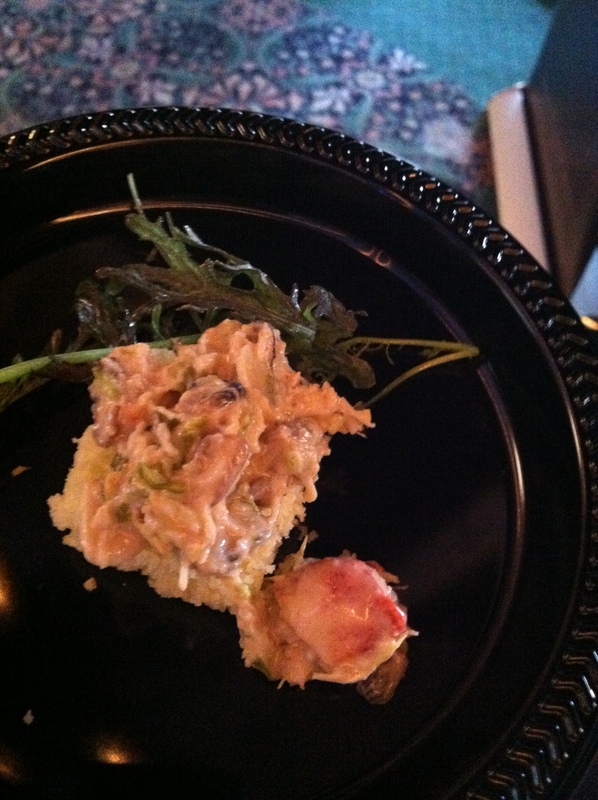 Instead I learned – via the chef’s phone photo – there are bowls of caviar served on coral reef tower. The theory being the bowls can be used for sharing. 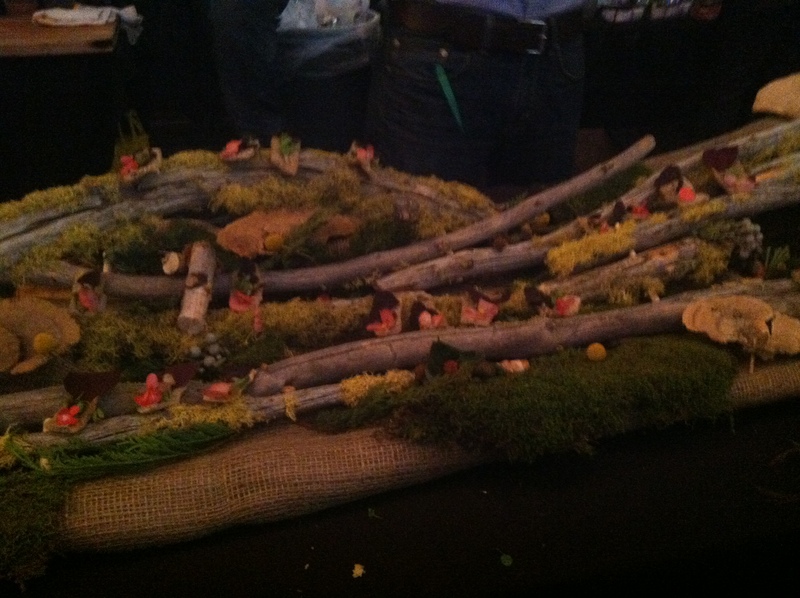 It’s a stunning presentation but…who shares caviar? A quick check of www.trurestaurant.com shows that vodka and I have a date at Tru to try all the different caviars! Best bite – I went old school. Runner up is the green goddess dressed BLT bite from http://sundaydinnerclub.com/ – had I been familiar with their concept I would have been pestering them for an invite to their next pop up dinner event but I was distracted by the BLT – not the first or last time that ‘s gonna happen. Above is the Celebrity Cruise Lines -promoting their I can attest to delish food on board – Kobe beef Chicago hot dog with perfect poppy bun, cherry tomatoes, goat cheese and caramelized deliciousness on top. I spent a very special few minutes enjoying this goodness and a few shameful ones devising a way to put a few in my purse. Weiner Circle, I am cheating on you with an upgrade! 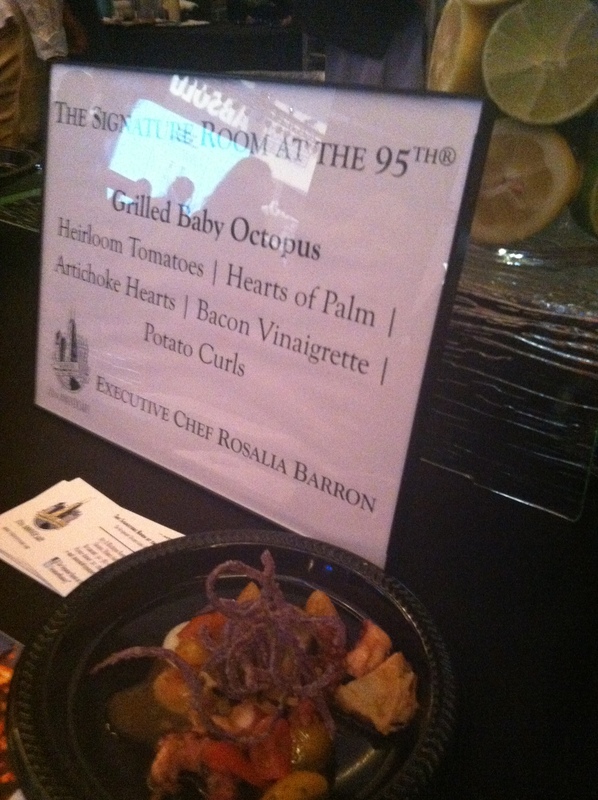 So that I could give my hog-y best to all 100 chefs I didn’t really drink but the concoctions were crazy awesome! What is bergam? I need to find out! If you would like a post of just Taste of Nations Cocktails leave a demanding comment and I will abide if there is interest. Meantime – how cute is that Absolut bottle? I want matching shoes. 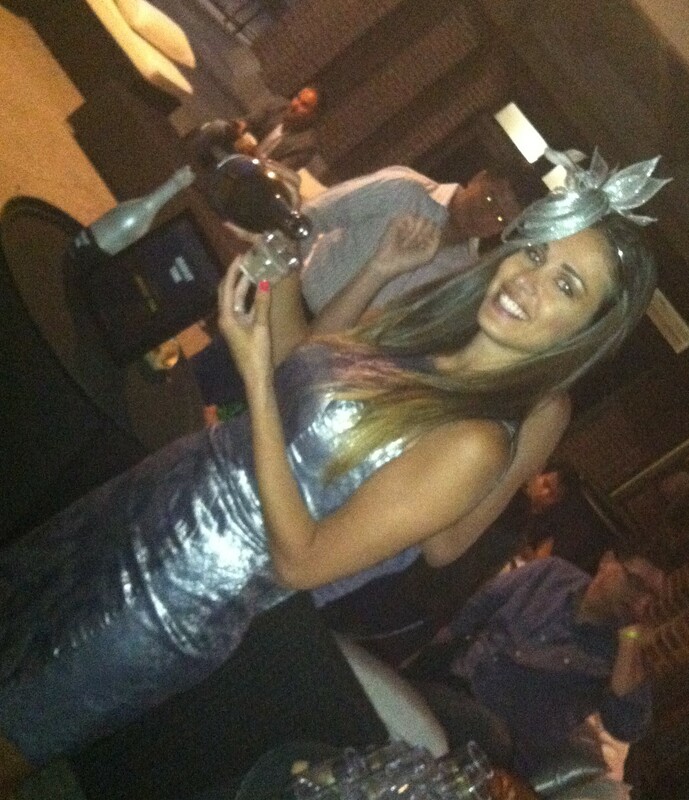 Speaking of cute Absolut items -I give you – this lady and her fascinator . She’s serving Absolut Tune – it’s sparkling Sauvignon Blanc and vodka blend with 14% alcohol – Happy New Year! Who cares what year it is if you are ringing it in with that! If you would like to read about my recent visit to The Aviary – just enter your email to receive posts to your inbox every Tuesday and Friday – food, travel and tall tales – you’ll always know what’s the Mary Delia!